Podicipediformes, aka Grebes, are freshwater diving duckish birds that are not ducks. For an order they are neither diverse nor disparate. Twenty two species are distributed among six genera, depending on what happens to be extinct, and for the most part one grebe is like another. Also, Grebes share two characteristics that end up being bad news given the state of the planet we are in. First, they are somewhat specialized in their diet and habitat, not able to nest in a wide range of places or switch their food acquisition style easily. (That of course is true of many birds.) Second, they are not great at dispersal. This makes Grebes vulnerable to climate change and the predation of invasive species. Like many birds, Grebes are mainly preyed on by other birds, but also, because Grebes liv in and on and near (mostly) fresh water, they are also preyed on by the smaller carnivores such as ferrets. And, in South America, there is at least one species that is being heavily preyed on by North American Minks which are not supposed to be in South America. If you’ve ever seen a Mink at a distance (a live mink, not a coat) you know that they are cute frolicking fun loving land otters. If, however, you’ve ever seen wild Mink up close, or perhaps been near a mother Mink when she thinks her kits are being threatened, you’ll know that they are vicious beasts with a bad attitude. It is easy to see how Minks set lose in a welcoming habitat could eat an entire species. Which brings us to the Hooded Grebe Podiceps gallardoi. The Hooded Grebe was discovered in 1974, and have been going extinct ever since. Their natural range is in a smallish region of southern South America. They breed on a number of basaltic lakes in southwestern Argentina, and it is not entirely clear where they all winter, but some wintering Hooded Grebes have been found outside their breeding range (and a few none-breeding birds have been found year round at two locations on the Atlantic, apparently). We estimated the present population size of the Hooded Grebe Podiceps gallardoi and compared it with the population in 1985. During the breeding seasons 2009/2010 and 2010/2011 we monitored 251 lakes on the main plateaus of Santa Cruz province, southern Patagonia, Argentina, where the entire population of Hooded Grebes spends the breeding season. During 2009/2010 we monitored 131 lakes and observed 521 Hooded Grebes in 16 lakes, while during 2010/2011 we monitored 186 lakes and observed 535 individuals in 14 lakes. At both breeding seasons five lakes contained near 85% of the population. We only observed 6 breeding colonies, two in 2009/2010 and four in 2010/ 2011, totalling 242 nesting attempts. Nearly 90% of the nests failed during egg stage, mainly due to strong winds and depredation by American mink Neovison vison. Only 28 nests hatched chicks, but none of the young survived to independence due to low temperatures. We compared the results of our 2010/2011 survey with one conducted during 1984/1985 and detected that the population diminished by approximately 80%. This decline was observed on all but one plateau (“Buenos Aires”) where most breeding attempts occurred. Our results show that at present Hooded Grebes are highly dependent on a few suitable lakes where they congregate to breed. We analyse possible causes for the decline of the population and propose conservation actions to protect this species. The authors divide the threats to the Hooded Grebe into three categories: biotic, abiotic, and incidental. Biotic includes predation of eggs and chicks by gulls, competition and predation by rainbow trout, and predation of eggs, chicks, and adults by mink. Other competition for nest sites by other birds is also included in this category. Abiotic effects include over-grazing which causes soil erosion which may change the conditions of the lakes, some volcanic eruptions that affect lake quality, and increase wind speeds as well as drought caused by climate change which affect nest sites. The third category includes accidental capture (bycatch) in fisheries in nearby waters and the effects of artificial lights in developing cities near wintering grounds which may increase collisions among migrants. Is there anything that hasn’t gone wrong for these birds? We estimate that current total population of Hooded Grebes is 800–900 individuals. Taking into account that at present most Hooded Grebes attempt to breed in a few lakes on Buenos Aires and Asador (and perhaps Siberia) plateaus, the first conservation action is to protect these lakes. The main actions at these lakes should be: 1) prevent the introduction of fish, in particular rainbow trout, 2) control and extirpate American mink, and 3) control anthropogenic sources of food for Kelp Gulls. Considering that in the 1980s most Hooded Grebes bred on Strobel plateau, it will be important to start a restoration programme at lakes that were used in the past. In addition, although there are no records of Hooded Grebes in fisheries bycatch at the main wintering grounds (estuaries of the rivers Coyle, Gallegos and Santa Cruz), there have been records of bycatch of other bird species (Flying Steamerduck Tachyeres patachonicus, Magellanic Penguin Spheniscus magellanicus, cormorants Phalacrocorax spp. and Great Grebe; M. B. Alegre, pers. comm.). 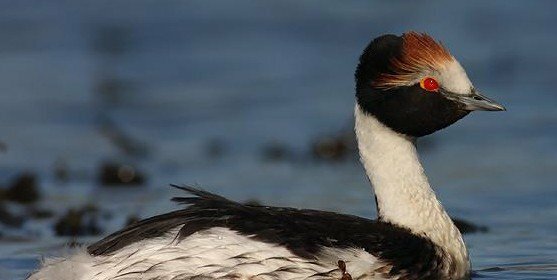 Therefore, it is important not only to take conservation actions at the breeding grounds but also to study interactions between Hooded Grebes and fisheries at the wintering estuaries of the Atlantic coast of Santa Cruz. 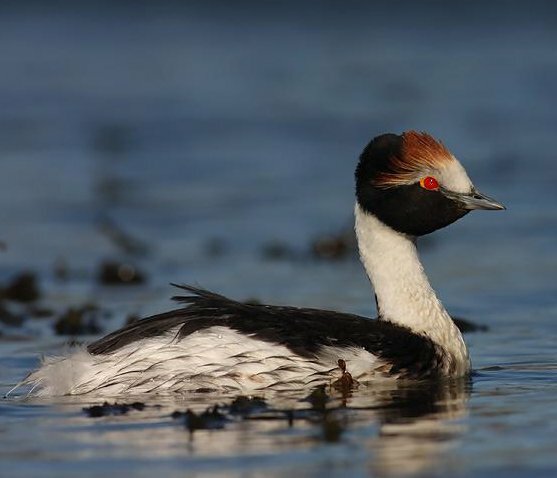 The photograph of the Hooded Grebe is from BirdLife International. Roesler, I.; Casañas, H.; Imberti, S. 2011. Final countdown for the Hooded Grebe? Neotropical Birding 9: 3-7. We have feral/escaped ferrets/polecat-ferret hybrids, and wild polecats in Europe and Asia. Which could well be eating Eurasian grebes. Badriya, good point about ferrets. Animal Diversity Web and some other sources list ferrets as predators on grebes, but they are probably referring to grebes in Eurasia. I also thought the use of the word “ferret” to describe mustelids as a group was a bit odd, but I was able to “weasel” out its meaning. I’m pretty sure the source I looked at don’t mean “ferret” to refer to all mustelids.The term “ferret” is a correct, though perhaps weasley, term for european polecat. I suppose I could contact the original source and badger them for a clarification.